Fans of the e-sports Overwatch League watch as the sixth-seeded Philadelphia Fusion compete against the fifth-seeded London Spitfire in the Overwatch League Grand Finals at the Barclays Center in New York City on Saturday, July 28. Philadelphia lost to London 2-0 to finish second in the league and take home $400,000 in prize money. Philadelphia Fusion esports team makes the Overwatch playoffs. Is this the start of a billion-dollar industry? 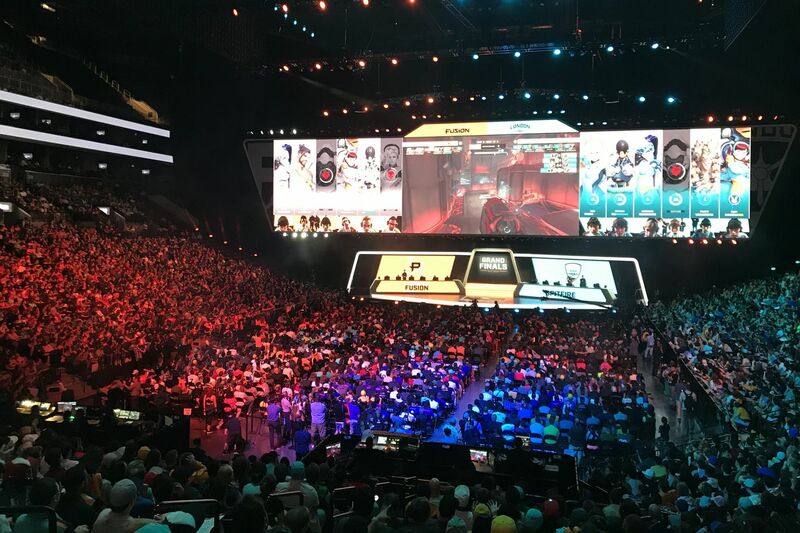 The sixth-seeded Philadelphia Fusion lost to the fifth-seeded London Spitfire, 2-0, in the inaugural grand finals of the e-sports Overwatch League in front of a sold-out crowd at the 20,000-seat Barclays Center, with more watching the championship on ESPN and streaming platform Twitch. Play-by-play announcers, or "casters," commented on the on-screen action and analyzed the match between rounds. Tickets for the event were originally priced at $60 and cost up to $200 on resale sites. "To pack a major arena in a major market and also be on ESPN and [cable channel] Disney XD, the future is bright" for the Overwatch League, Fusion chief business officer Joe Marsh said. "I think people are going to think the Overwatch League is here to stay." Philadelphia Fusion fans cheer at the Overwatch League grand finals at the Barclays Center in New York City on Saturday. Philadelphia lost to London, 2-0. As young adults continue to cut their cable cords and more e-sports games introduce professional leagues, e-sports viewership continues to grow, according to a report from the marketing analytics firm Newzoo. The report predicts the global e-sports audience will grow to 380.2 million this year, up from 335 million people in 2017. The firm estimates that revenue should rise from $655.3 million in 2017 to $905.6 million in 2018 and the e-sports industry will reach $1.4 billion by 2020. E-sports viewing is becoming more mainstream with a recent multiyear deal between Disney and Activision Blizzard Inc., the creators of Overwatch, to air league matches on the company's channels, including ESPN networks and the Disney XD channel. The company's coverage started July 11 with the playoffs on Disney XD and continued through the finals, which aired on ESPN networks. "ESPN has a lot of channels, so I expect a lot of Overwatch to be on those channels," said Laura Martin, senior analyst for entertainment and internet companies with Needham & Co. LLC. She said the deal was made so recently that "ESPN just didn't have the time available to air it" as frequently this year, but the amount of coverage on those channels will increase once Overwatch is built into the company's programming schedule. The best-of-three series took place over two days, with the Fusion losing the first match of the series, 3-1, Friday and the second, 3-0, Saturday. Philadelphia fans who made the trip to watch the finals were scattered throughout the crowd after the franchise chartered buses to take fans to the event for free. Fans of both teams cheered and pounded noisemakers together during the match, while color-changing wristbands flashed the franchises' colors throughout the arena. With its second-place finish, Philadelphia earned $400,000 of the $1.4 million prize pool, to be split between the team and players. This takes the team's total prize money to $525,000 during the season: The Fusion won $25,000 and $100,000 from earlier playoff success this year. E-sports, a common term for online video games, are particularly popular among millennials. Game developers say there are now more than 40 million Overwatch gamers worldwide, and Fusion's Marsh said more than 300,000 of those gamers live in the Philadelphia region. >> READ MORE: Philadelphia Fusion esports team makes the Overwatch playoffs. Is this the start of a billion-dollar industry? This year, Comcast Spectacor purchased a team slot in the new Overwatch League for a reported $20 million and formed the Fusion. The team plays in the Flyers' orange, white, and black colors, and was one of 12 teams in the league that battled each other to achieve objectives in the Overwatch video game — similar to the children's game king of the hill — before a live crowd and hundreds of thousands of viewers online. The game is a first-person, team-based shooter game with six players per team playing at a time. E-sports teams, including Philadelphia, receive a share of the league's revenue and further profit through merchandise sales as well as jersey partnerships, in-arena signage, and prize money from playoff wins. After building up the team's fan base in its first season, Marsh said the Fusion is focusing on making the franchise more profitable over the next year and beyond. "We made a conscientious effort in the 2018 season to really build our brand," he said, calling the 2018 season a "building block" for the franchise. "We learned that in order to monetize your asset, you have to have an authentic brand and really be able to connect your fan base, your sponsors, and your advertisers with your brand." The Fusion has hired a head of partnerships to build up the team's dealings with jersey and digital sponsors. One of the next steps, Marsh said, is determining the "right size and amenities" for an e-sports arena in Philadelphia. Because the matches were played in Burbank, Calif. this season, the team relied heavily on social media along with watch parties to connect with local fans. Since January, the Fusion has gained more than 72,000 followers on Twitter and over 4,800 members on Discord, a gaming communication site. A group of fans also started a booster club, called the "Fusion Fam," which has engaged with the team and its players on Twitter. Fusion fans traveled to the Barclays Center to watch the championship on Saturday. Fusion fans were already looking ahead after the team's championship loss as they chanted "season two" in the Barclays Center immediately after the match. Courtney Miller, a Fusion fan from Philadelphia who traveled to New York for the finals, said the Fusion and its fans should be proud of their season and the turnout for the championship match. "I think it's not only huge for the Overwatch League, it's huge for e-sports in general," she said. The league will only get "bigger and better every year," said Mike Berenato, a Fusion fan from the Deptford area. "I think with Blizzard, they could take it as far as they want. I think what Blizzard has done this year will bust it open for just about any game that can gain as much of a following as Overwatch has."